Falcons sophomore forward Ryan Spafford (7) fights for a possession of the ball against a Christian Life player during an April 20 contest (Jason Arndt/The Report). 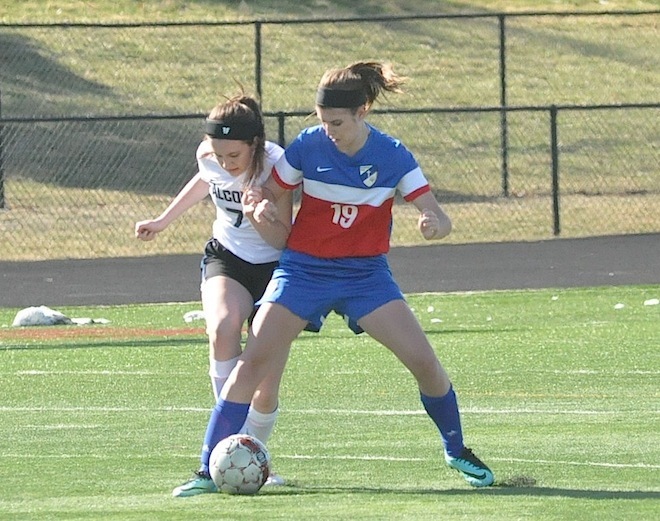 The Westosha Central High School girls soccer team enters its season with a youth movement, but after the first four contests, the Falcons have looked like an experienced squad. The Falcons, who finished 5-9-3 last year, opened their season without 11 graduated seniors and three seniors who decided not to return. Westosha Central, however, has found a way to offset the losses, courtesy of returning captains Lindsey Meyers, Kelsey Gross and Mackenzie Fricke and an influx of promising newcomers. Meyers, who will hold the position of back, is the lone returning senior while Gross, a goalie, and midfielder Fricke are juniors. “Kelsey Gross is Kelsey Gross, she is a phenomenal keeper, she has a large presence and has helped us out,” said Falcons coach Luis Totera. While Fricke solidifies the midfield, Totera will rely on Meyers’ experience on and off the field, noting the senior brings an unselfish personality to the team. Last year, according to Totera, Meyers showed the willingness to step into a utility role for the benefit of the team. “Her character is as big as her play,” he said. “I think they will do well, they have the most experience,” Totera said about the team captains. Along with the captains, the Falcons bring back Kayli Bohr (junior defender), Anna Delisi (junior defender), Anastasia Doyle-Bruce (sophomore defender) from last year’s opening varsity roster. The Falcons also welcome junior midfielder Megan Zeller, a transfer from Kenosha St. Joseph, who has scored three goals in the Falcons first four games. Making the leap from junior varsity ranks are Maggie Hillock (senior forward/midfielder), Kelsey Kurylo (junior defender), Trianna Rudd (junior defender/midfielder), Jordan Dahlberg (sophomore midfielder), Samantha Ciesel (sophomore midfielder), Ryan Spafford (sophomore forward) and Paige Wysiatko (sophomore midfielder). Additionally, junior Kaitlyn Hill (defender/midfielder) and freshmen Alex Denman (midfielder) and Maya Klementzos (midfielder) will also see playing time. “Alex and Maya, I think, have done a great job so far and they will help us a lot in the future and possibly this year as they continue to grow,” Totera said. The Falcons, who suffered a season-opening shutout at Antioch April 13, bounced back with three consecutive victories. On April 20 against Kenosha Christian Life, Zeller knocked in the Falcons lone goal, which gave the Falcons a 1-0 victory. The Falcons then followed up with a 2-1 Southern Lakes Conference win to Lake Geneva Badger on April 24. In the April 24 SLC opener, Denman opened the scoring at the 15th minute, when she took a corner kick from Klementos. Zeller, meanwhile, added the decisive goal on a pass from Fricke in the 47th minute. Gross saved seven of eight shots. Against county rival Wilmot, the Falcons scored three first half goals, including two within seconds of each other to come away with a 4-0 victory Thursday. At 12:02, Ceisel posted the first score on an assist from Meyers. Following a Zeller goal, assisted by Wysiatko at 32:18, Wysiatko added a goal of her own 22 seconds later on a Fricke pass. Gross added the Falcons fourth goal in the second half.